Anyone that has dined with me for breakfast know that I generally don’t do breakfast, usually opting for just a cup of coffee, and maybe a sweet roll or something. But when I get breakfast, I generally go all out. My favorite breakfast dishes include pancakes (yeah, I’ve got to write up my favorite pancake joints as well), waffles (my college roommate Steve still likes to tell people about my late night waffle cravings in college), a proper biscuits and gravy, all things hash brown related, and eggs Benedict. The last of these sometimes surprises people, since one of the problems I usually have with American breakfasts is that I’m not generally a fan of eggs. Fried eggs generally don’t excite me, and I’ve discovered over the years that entirely too many otherwise-talented cooks have the ability to completely kill omelets and scrambled eggs. But a perfectly poached egg can be quite pleasant, and combined with some good pork and well-executed Hollandaise sauce, that simple poached egg can be elevated to an item of near wonder. 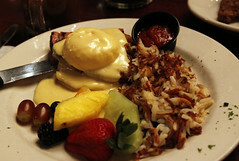 The concept of Eggs Benedict is so simple, consisting of a half of an English muffin, topped with ham or bacon, poached eggs, and topped with said Hollandaise sauce. Simple in concept, but within this dish lie two serious challenges to the breakfast cook. Like the scrambled eggs I mention above, properly poaching an egg is an art that a lot of cooks just haven’t mastered. They either over-poaching it, having it collapse in the poaching water creating little ribbons of egg white around a gooey yolk, getting waterlogged (eww…), or just not ending up with the right texture. A properly poached egg has a nice soft yolk and a fluffy, light, and pillowy egg yolk, contained in a fairly compact package. The next challenge is getting a proper Hollandaise sauce. Again, this is a simple concept, a basic emulsion of egg yolk and butter (lots of butter! ), usually seasoned with lemon juice, salt, and a little cayenne pepper. Done right, the resulting sauce is yellow in appearance, with a texture that is smooth and creamy. The flavor should be rich and buttery, with a slight acid tang tang from the lemon and a slight bite from the pepper, but not enough so to mask the flavors of the egg and ham. There’s a reason that Hollandaise is one of the classic Mother Sauces of haute cuisine. Alas, it’s also a sauce that’s easy to screw up, being very temperamental to correct temperature, and very easy to break if you don’t get good emulsification. It also doesn’t keep very long, so you can’t easily make a 5 gallon batch of it for your kitchen. Combine this with a decent English muffin and a quality pork product (the standard is generally what we American’s call “Canadian bacon”, but other bacon and ham products work quite well), and the result is sublime. It’s also a really good benchmark of how good a restaurant’s breakfast crew is. And it’s so often messed up, that I even remember a chef in Minnesota (Alexander Dixon) open up a breakfast cafe (Z’s Cafe) just so he could serve proper Benedicts and related variants (alas, both of Dixon’s places are now closed, although I hear he is still making soup for several local coffee shops in the Twin Cities). 1. Al’s Breakfast in Minneapolis. 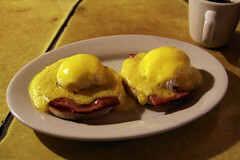 Shown at the top of the article, Al’s makes a seriously good Benedict. The eggs are perfectly cooked, the ham slices perfectly seared, and the Hollandaise perfectly rich and creamy without outshining the eggs and ham. If there’s a better execution of a classic Benedict, I’d like to know so I can try it. Sadly, I’d been eating at Al’s for more than 15 years before actually trying this (since there are so many other items on the Al’s menu that I just adore, like their CBH, their wally blues, and their Jose). 2. 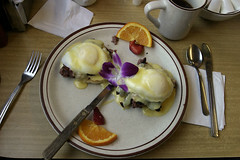 Wasp’s Diner in Woodstock, VT. Another good classic Benedict, with perfectly poached eggs and a good Hollandaise. What really impressed me about Wasp’s is that, on my visit, the cook was out of Hollandaise, so she whipped up a batch to order, in about two minutes. The result was soft and tangy, with a nice dill note. 3. Hell’s Kitchen in Minneapolis. Going slightly off of the standard rendition, Hell’s Kitchen’s Benedict used a big slab of pit smoked beef instead of the seared ham common in most preparations. In this case, the end result worked well, with their well-done Hollandaise complementing the soft tender smokiness of the slab of ham. Again, a nearly perfect execution of a Benedict. 5. 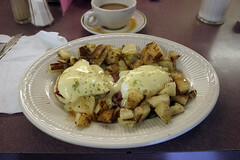 Modern Diner in Pawtucket, RI, has an extensive menu of Benedict variations, including substituting a variety of spicy meats in place of the usual ham. I rather liked both the linguica and corned-beef-hash Benedicts I had at Modern. The Hollandaise was softer than most, but that probably worked well with these substitutions. 6. Dream Diner, Tyngsborough, MA. This was quite a good Benedict. Like Hell’s Kitchen, Dream Diner uses a solid 1/2″ thick slab of ham. And it’s good ham at that, nicely roasted, flavorful, and not too salty. The eggs were nicely poached, and the Hollandaise sauce was quite flavorful (although I like just a slight bit more tanginess). So, where are your favorite Benedicts? Leave a Reply to Dennis K.
(Closed) For our other dinner out while we were spending an extended weekend in Vermont, we decided to go back to Waterbury and check out some of the locations. Since we moved to NH (more than 16 years ago, how time flies! ), Waterbury has definitely grown up from the fairly sleepy town that also sported a coffee roasting factory and an ice cream factory into something a bit more refined. It had one really well-regarded brew pub grow up, get flooded, and moving on to found a full-fledged, world famous brewery (now up in Stowe). It’s also had several restaurants and beer bars appear over the last decade or so. One of the newer arrivals in town is Allium.